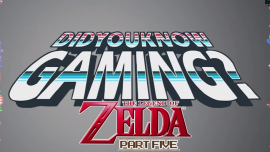 They’ve just made a new video about the Zelda series, featuring YouTuber PeanutButterGamer, that gives us an incredible amount of info about the series: I had no idea that Skyward Sword made references to the movie Titanic, or that there were supposed to be a bunch of different playable party members in Zelda II. This is the fifth video they’ve done on the Zelda series, and you should definitely check out the rest if you’re interested in this kind of stuff (here are parts 1, 2, 3, and 4). They’ve made tons of other videos surrounding Nintendo in general as well, most popularly series based on Mario and Pokémon, and if you’re interested in more non-Nintendo stuff, they’ve also made videos about the PlayStation 2 and the Grand Theft Auto series, among many others. What do you think about this? Did you know some of these already?